Motels are typically one or two-storey suburban structures announced with outlandish neon signs that belie the humbleness of the accommodations on offer. This basic rule certainly held true for the majority of Toronto's motels, which were once to be found in abundance in Etobicoke and Scarborough, the latter of which still boasts a dying strip of these roadside businesses. Looking up Jarvis from Carlton in the early 1960s with the first Four Seasons on the right. Photo via the Toronto Archives. Back in the early 1960s, however, there was one significant exception. 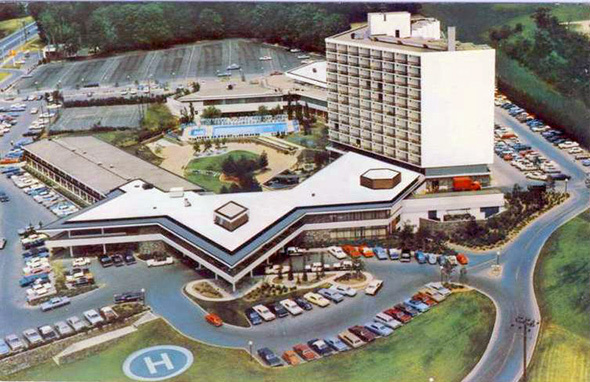 The Four Seasons Motor Hotel opened at Jarvis and Carlton streets in 1961 and served as the first property in what would become a luxury hotel chain with almost 100 properties worldwide. No ordinary motel, it was designed by architect Peter Dickinson at the behest of company founder Isadore Sharp. The elegant entrance to the Four Seasons Motor Hotel. Image via the City of Toronto Archives. Dickinson borrowed from the hallmarks of motel design, envisioning a low rise structure that surrounded a central courtyard and pool. The ads of the day were true — it was Toronto's first downtown motor hotel, but the idea wasn't to provide cheap accommodation. On the contrary, this was to be an urban oasis, far more similar to a resort than your typical hotel of the time. "People who came from out of town, they didn't know Toronto," Sharp told the New York Times in 2009. "What they saw was a charming little hotel, like an oasis, with a swimming pool, a courtyard. You create your own environment. It's all in the way you market the product." The concept proved popular from the outset, and Sharp and Dickinson quickly paired up to build something even more grand on an empty plot of land at Eglinton and Leslie streets in the form of the Inn on the Park. This property also had motel-like elements, but added two high rise hotel towers (the second one was built in 1971) to increase the total number of rooms to over 500. The poolside view at the Inn on the Park. Postcard via Chuckman's Nostalgia. This too was a smashing success in its early years, providing Toronto with a luxury resort that one could easily drive to for a restorative weekend or just to be seen lounging by the pool. By the time that second tower rose in 1971, however, Sharp had started dreaming even bigger. After the Inn on the Park, the company's focus turned global, opening its first international property in London back in 1970. Closer to home, Sharp's attention also turned toward more traditional hotel towers. A brief collaborative stint at the Sheraton Centre (1972-76) was followed by the acquisition of the then Hyatt Regency at 21 Avenue Rd. in 1978. 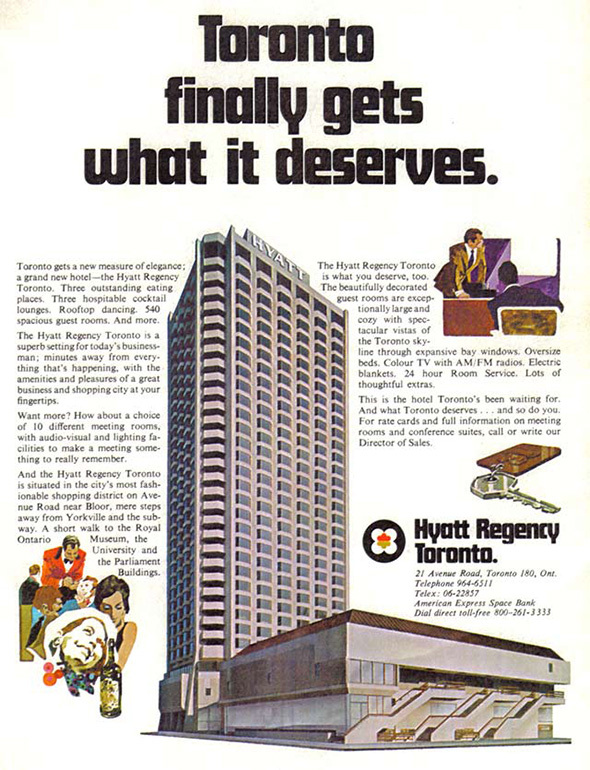 Hyatt Regency advertisement via jbcurio on Flickr. 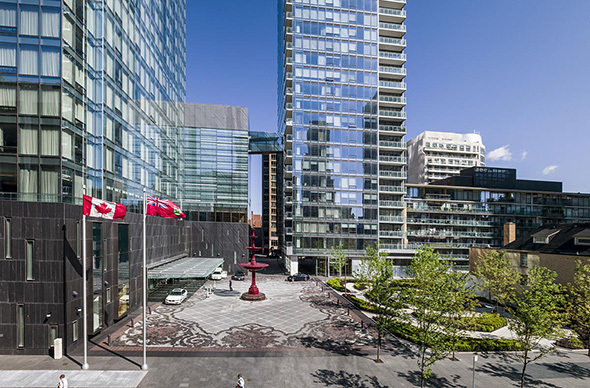 For many, this hotel was the face of the Four Seasons in Toronto, playing host to the city's most famous guests when TIFF took place around the Yorkville area. The original Four Seasons, on the other hand, only lasted for about 15 years before Sharp sold it to another hotelier, while the Inn on the Park was taken over by the Holiday Inn chain in the early 1990s. Neither of these properties remain, though in some sense their legacy is contained in the modern Four Seasons that currently sits at 60 Yorkville Ave. The design elements couldn't be further apart, of course, but Sharp wanted to do something important with a new hotel in his hometown. The entrance to Toronto's current day Four Seasons. Photo via Streetscape Canada. If there is one little connection between the first Four Seasons and its most recent counterpart in Toronto, it's to be found in the mist garden that sits adjacent to the main entrance. For the sentimental among us, it can't but recall that original courtyard which gave birth to one of the city's most successful companies.